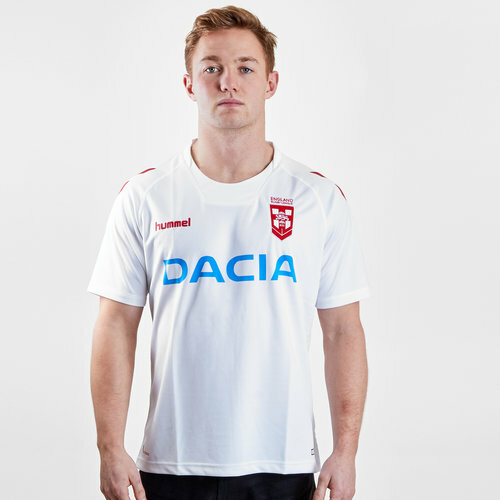 Show everyone that the Wall of White mean business when you pull on this England Rugby League 2018/19 S/S Replica Rugby Shirt by Hummel. The England national rugby league team represents England in international rugby league. It participates in the Rugby League World Cup, Four Nations and Test matches. Their first appearance in the Rugby League World Cup was in 1975, and they finished runners-up in 1975, 1995 and 2017. Currently, the team is ranked third in the world, behind Australia and New Zealand making these two teams their main rivals now but historically their rivals were Wales and France. 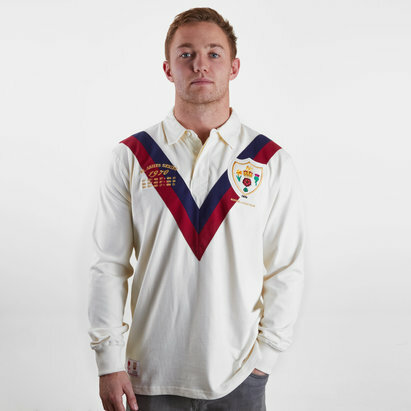 Made from 100% polyester this shirt sticks to tradition as it is predominantly white and as always features some form of red, which in this case is across the shoulders in a chevron design and also forming the nation's flag on the back of the shirt at the top of the neck. The Hummel logo is on the right whilst the nation crest is on the left with the team's sponsor - Dacia - across the middle.